Be the first to share your favorite memory, photo or story of Nathaniel. This memorial page is dedicated for family, friends and future generations to celebrate the life of their loved one. 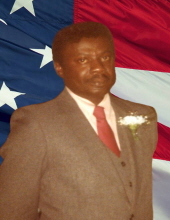 Goldsboro – Nathaniel Larry, 69, passed away on Wednesday, October 24, 2018 at Vidant Medical Center in Greenville surrounded by his family. Born on May 29, 1949 in Savannah, Georgia, he was the son of the late Robert Larry, Sr. and Rutha Mae Larry. Nathaniel served his country for twenty-two years in the U.S. Air Force. He worked as an Aerospace Ground Equipment Tech, retiring with the rank of Tech Sergeant. A man of great faith, Nathaniel was a member of Best Grove Missionary Baptist Church. Nathaniel will be remembered as a loving husband, father, grandfather, brother, and friend. The family will receive friends Friday, November 2, 2018 from 10:30 – 11:30 a.m. at Best Grove Missionary Baptist Church followed by a service to celebrate his life at 11:30 a.m. with Rev. Joe Jackson officiating. Burial with full military honors will follow at the Eastern Carolina State Veterans Cemetery. Nathaniel is survived by his wife of forty-two years, Earma Larry; daughter, Latrina Jones of Wake Forest; sons, Courtney Larry and Willie Jones, both of Goldsboro; siblings, Juanita Larry, Festine L. Butler, Henry Lee Larry and wife, Diane, Stevie Larry, all of Savannah, GA and Ronnie Larry of Sunnyville, CA; God-son, Anthony Hall and his family of Goldsboro; and eight grandchildren. In addition to his parents, he was preceded in death by his daughter, Patricia Ann Jones; and brothers, Franklin Larry and Robert Larry, Jr.
To send flowers or a remembrance gift to the family of Nathaniel Larry, please visit our Tribute Store. "Email Address" would like to share the life celebration of Nathaniel Larry. Click on the "link" to go to share a favorite memory or leave a condolence message for the family.